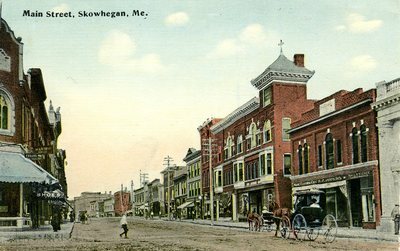 "Skowhegan Main Street Postcard "
An image scanned from a postcard with a caption that identifies the scene as Main Street in Skowhegan, Maine. Horse drawn carriages are traveling down the road's dirt surface. Business signs include lettering that read, Shoes, Kodaks, Dentist, Maine Clothing Co., H. C. Judkins, and Miss L. M. Withee. The postcard is not dated or postmarked.